WhatsApp could soon get the much-awaited ‘Dark Mode’ feature as the Facebook owned messaging app has started testing it. The feature was seen in the beta version 2.19.82 of WhatsApp. The mode is still under development and is not available in public domain yet. Recent beta versions have also revealed that WhatsApp is working on several new features like “Forwarding Info” and “Frequently Forwarded”. Being the most popular instant messaging app, WhatsApp has been introducing new features thick and fast and the new Dark mode is expected to further improve users’ experience and also reduce the battery consumption of phones, especially the ones with AMOLED displays. This anticipated feature is not only easier on eyes but also offers a neat look. At 100 percent screen brightness, it consumes 60 per cent less battery. Therefore, Dark mode on WhatsApp will have multiple benefits for a user who is constantly sending and receiving messages. The images of this mode have been published by WABetainfo noting that the feature has been implemented in Settings only. The Screenshots posted by WhatsApp beta tracker website show that the new mode has been applied to the notification area, data and storage settings, chat settings and account settings. Unfortunately, we don’t get to see what chat screens look like with the Dark Mode on. WhatsApp’s Dark Mode isn’t however a fully black mode. 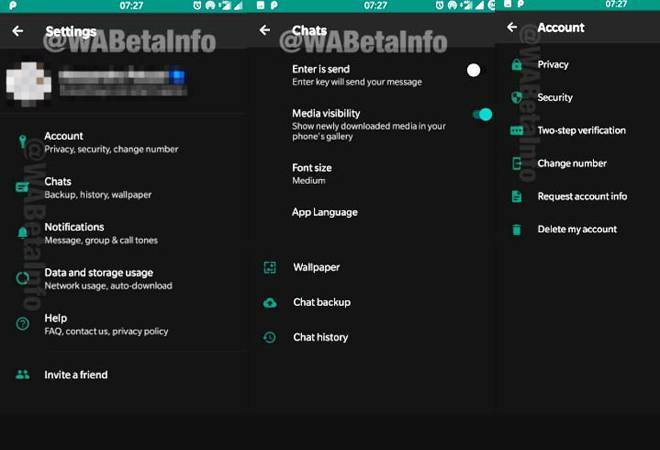 Unlike most dark modes, the screenshots posted by WABetainfo reveal a dark grey colour. Meanwhile, there is no time frame as to when the new mode will be released for everyone but WhatsApp needs to hurry as many of its competitors – Telegram, Messenger, Android messages – have already added the Dark Mode.